Melt margarine in 2-quart saucepan over medium heat. Stir in flour, salt and pepper. Cook, stirring constantly, until bubbly; remove from heat. Stir in milk and broth. Heat to boiling, stirring constantly. Boil and stir 1 minute. Stir in remaining ingredients. Pour into ungreased 2-quart casserole or square baking dish, 8x8x2 inches. Bake uncovered 40 to 45 minutes or until bubbly. Garnish with parsley sprig if desired. For a crunchy topping, don't mix the almonds in with the other ingredients. Instead, sprinkle the almonds over the casserole 10 minutes before it's done baking. 1 can (4 ounces) mushroom stems and pieces, drained, can be substituted for the fresh mushrooms. Tuna-Rice Casserole: Substitute 1 can (12 1/2 ounces) tuna, drained, for the chicken. 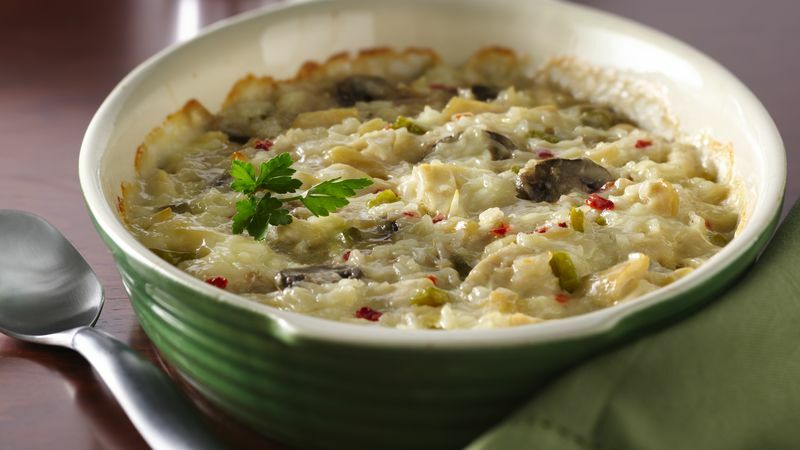 Turkey-Wild Rice Casserole: Substitute 2 cups cut-up cooked turkey for the chicken, and wild rice for the white rice.